A single queue served by several cashiers may serve your retail chanel best. Here this Wait For Next Cashier Queue Management advises patience, your turn will come. Look close for an “eyebrow” element thanking you for shopping. A few final merchandise offerings are clustered around the queue path for browsing, purchase, or just pure distraction value in helping the time pass more quickly. 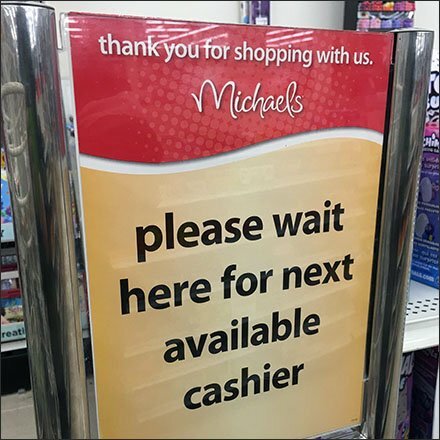 This Wait For Next Cashier Queue Management sign seen at Michaels.